Heat gas or charcoal grill. In small microwavable bowl, combine all glaze ingredients; mix well. Microwave on High for 30 seconds. Stir; set aside. In small bowl, combine paprika and peppered seasoned salt. Sprinkle both sides of pork chops with paprika mixture; rub into surface of pork. When grill is heated, place pork on gas grill over medium heat or on charcoal grill 4 to 6 inches from medium coals. Cook covered 12 to 15 minutes or until pork is slightly pink when cut near bone, turning twice, and brushing glaze on each side during last 5 minutes of cooking time. Discard any remaining glaze. Avoid all of that running back and forth from the kitchen to the grill by outfitting yourself with a tool with all the essentials you're likely to need at the grill. Choose a wicker, plastic or wire basket that your tools will fit in, and keep it ready to go for grill nights! 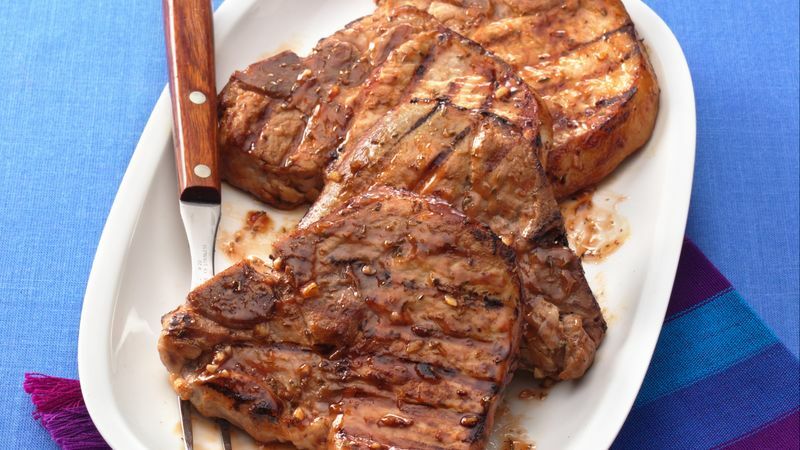 Broiled Honey-Glazed Pork Chops: Place pork chops on broiler pan; broil 4 to 6 inches from heat using times above as a guide, turning twice, and brushing glaze on each side during last 2 minutes of cooking time.